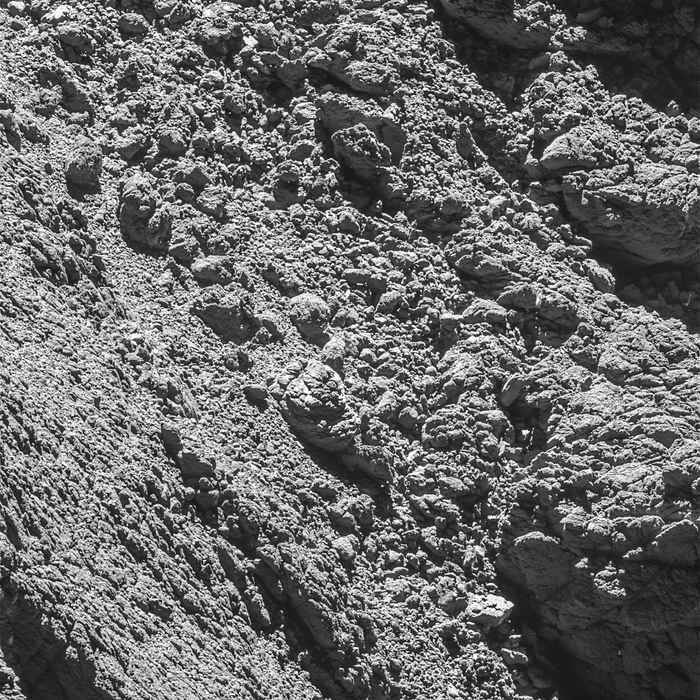 September 5, 2016 – Less than a month before the end of the mission, Rosetta’s high-resolution camera has revealed the Philae lander wedged into a dark crack on Comet 67P/Churyumov–Gerasimenko. 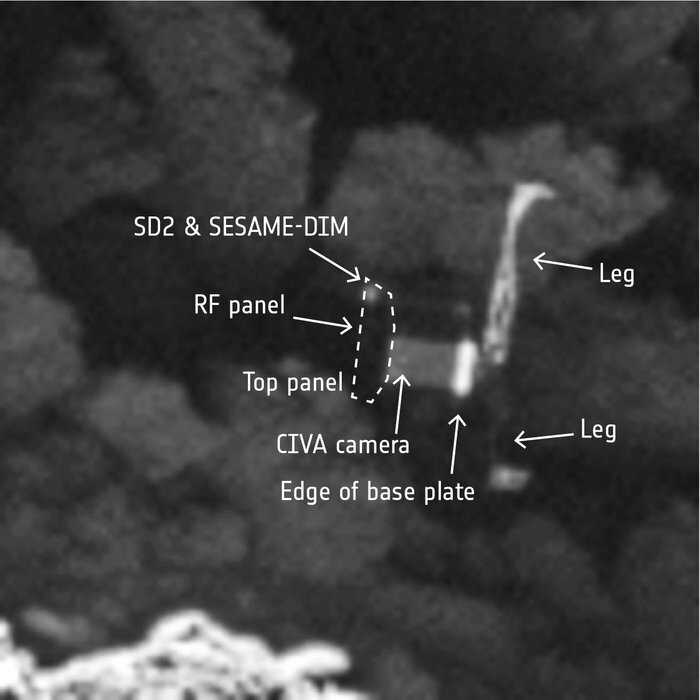 The images were taken on September 2 by the OSIRIS narrow-angle camera as the orbiter came within 2.7 km of the surface and clearly show the main body of the lander, along with two of its three legs. “With only a month left of the Rosetta mission, we are so happy to have finally imaged Philae, and to see it in such amazing detail,” said Cecilia Tubiana of the OSIRIS camera team, the first person to see the images when they were downlinked from Rosetta yesterday. “After months of work, with the focus and the evidence pointing more and more to this lander candidate, I’m very excited and thrilled that we finally have this all-important picture of Philae sitting in Abydos,” said ESA’s Laurence O’Rourke, who has been coordinating the search efforts over the last months at ESA, with the OSIRIS and Lander Science Operations and Navigation Center (SONC, CNES) teams. After three days, Philae’s primary battery was exhausted and the lander went into hibernation, only to wake up again and communicate briefly with Rosetta in June and July 2015 as the comet came closer to the Sun and more power was available. 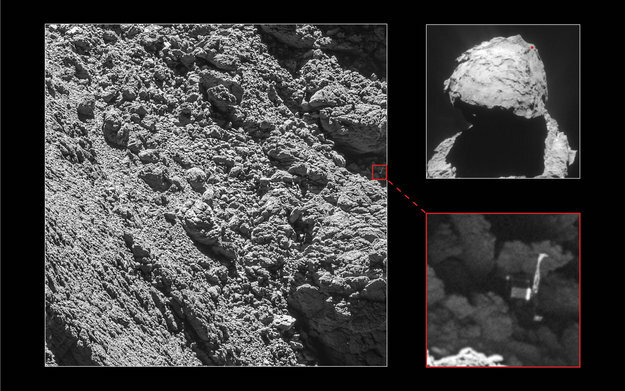 “This wonderful news means that we now have the missing ‘ground-truth’ information needed to put Philae’s three days of science into proper context, now that we know where that ground actually is!” said Matt Taylor, ESA’s Rosetta project scientist. “Now that the lander search is finished we feel ready for Rosetta’s landing, and look forward to capturing even closer images of Rosetta’s touchdown site,” adds Holger Sierks, principal investigator of the OSIRIS camera.